Today is the day! 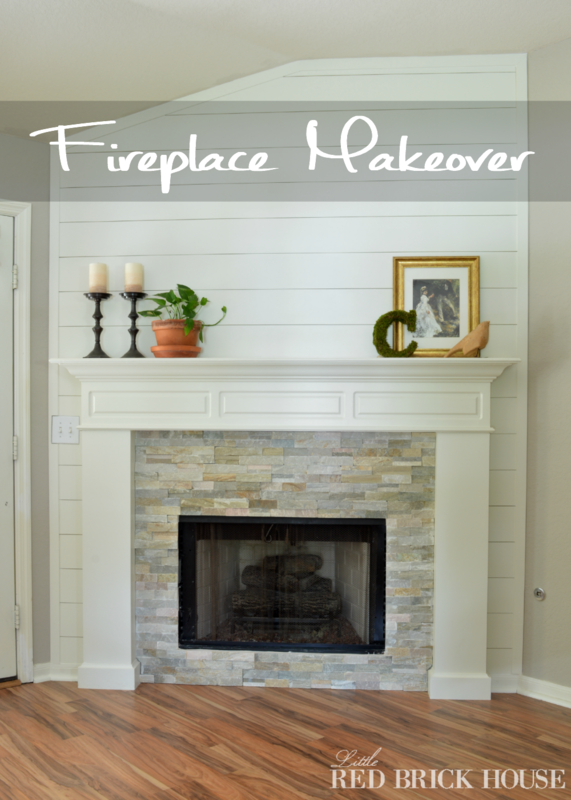 I’m so excited to share our farmhouse fireplace makeover reveal with you! We worked so hard on this project and are very happy with the results. You would think that being first time homeowners we would want to ease our way into DIY-ing with a small project like window treatments or crown moulding. Well, we decided to dive right in and remodel our fireplace. Being such a focal point of the room, it was hard not to notice everyday. Most people would look at the before picture and think that nothing is wrong with it and really, there isn’t anything wrong. Only, it’s not our style and we felt like it could be so much more. We had big dreams for this space and I literally couldn’t wait to get started. After weeks of my husband putting off the renovation, I just grabbed a hammer and whacked away into the wall tiles to see how easy they would be to remove. To my delight, they crumbled off pretty nicely. And to my hubby’s horror, the start of the fireplace demo had officially started! There was no turning back at this point because in just a few short weeks we had family coming to visit from out of town. Here’s a picture from the MLS listing when we were house hunting. I’m not a huge fan of the faux finish wall and that trim around the tile is just too dinky for my taste. And here it is after we painted the living room a lighter color and started the demo process. Please excuse the terribly grainy iPhone picture and don’t mind the fat cat photobomb. Oh, and apparently we don’t know how to paint without getting it all over the ceiling. The floor tiles on the wall weren’t really our thing, so we knew that we wanted to replace those with stone or marble tiles. In the end the stone won out and we couldn’t be happier. We ended up adding columns in the front and planking on the wall. The mantle was lowered three inches to lose some of the awkward space between it and the firebox. In the future, we’d like to replace the gas logs with glass crystals and the mesh curtains with glass doors. But for now we’re really happy with the progress we’ve made. The room definitely feels lighter and brighter and is more “us”. Check out the rest of the farmhouse fireplace makeover here! Previous Post: « Liebster Award! Absolutely stunning! You guys did an amazing job! Thank you so much, Erin! We absolutely love it! Stunning! Nice job! What is the color of the wall? 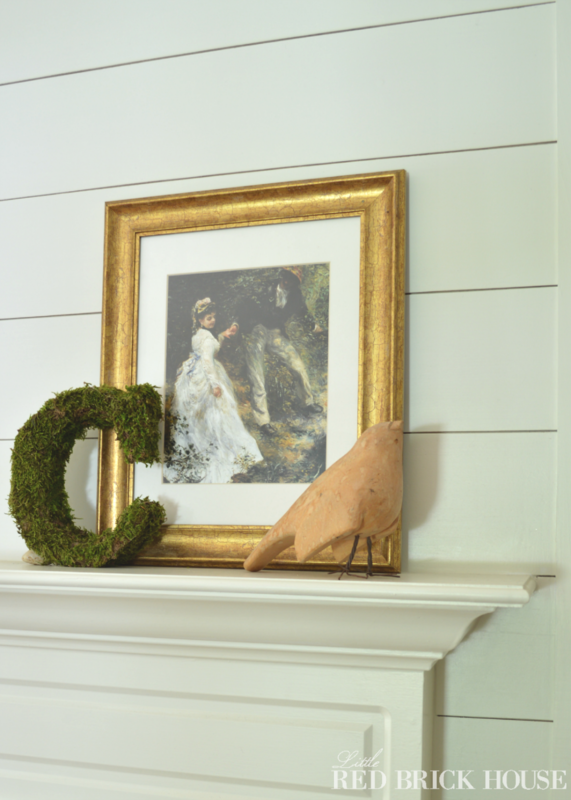 You mentioned the mantle color is SW alabaster but what is the beautiful wall color? Thank you, Beth! The wall color is Agreeable Gray from Sherwin-Williams. Love love love!!! Very creative and attention to details! What’s next!?!! Thank you very much! You will just have to stick around see! Lol! I really want to get the rest of the living room finished off so I can finally get a home tour started. Thanks, Leigh Anne! Glad you stopped by! This is stunning! I’m so impressed! Thanks for sharing. 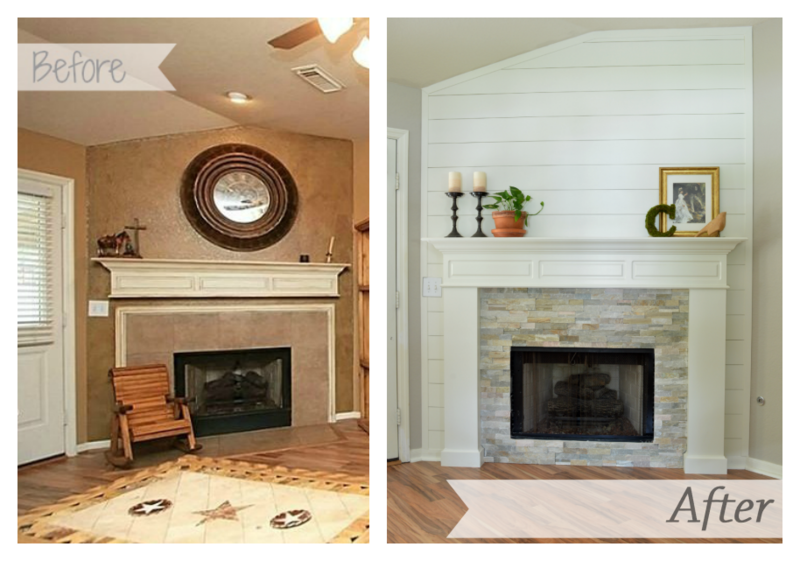 Sarah, your fireplace is absolutely so perfect for your space and really pretty to look at. The original look disjointed and an afterthought. How fabulous is this makeover?!!! Thank you, Terry! I completely agree with you. It definitely has more personality now. Thanks for stopping by! Wonderful transformation! Love your stone choice, the planking and the paint color. 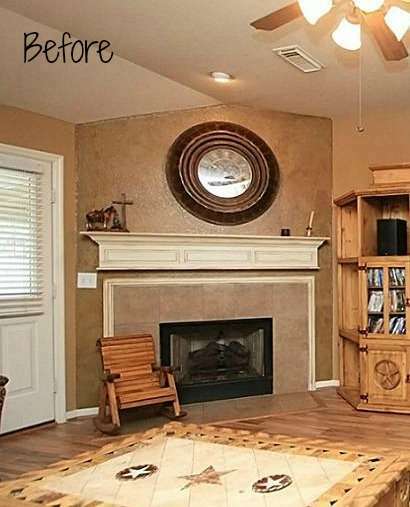 It doesn’t even look like the same fireplace. Thank you, Suzanne! I’m glad you like it! SO gorgeous. That tile! Ah! That planking! Ah! I’m in love. Thank you, Bre! I have a feeling that fat cat will be making more appearances in the future, LOL! that looks amazing, and your cat is super cute. my 2 surprise me with where they jump and climb, too. This is beautiful! What a difference! Thank you, Camille! I can’t believe the difference either. Wow, Sarah! This turned out beautiful! Great job. Thanks, Heidi! And thank you for stopping by. I love the transformation! It looks so light and elegant right now ! I am so jealous of this! It looks amazing and so cute. Definitely more personality than the before… Great great great job! You are so sweet, Randell. Thank you! I love the wall planking! Can’t wait to see how you did that! Great transformation! Thank you, Jayleen! I’m quite smitten with it myself. 🙂 I’ll have the tutorial up soon! Well gosh, Allison. You’re gonna make me blush! Thank you so much for your kind words. You made my day! This is awesome Sarah!! What a great transformation, it looks so light and airy now. I love the planked wall and the stone. Beautiful! I love this! Beautiful! Thanks for sharing with us at Your Designs This Time! Thanks, Emily! And thank you for featuring it this week! 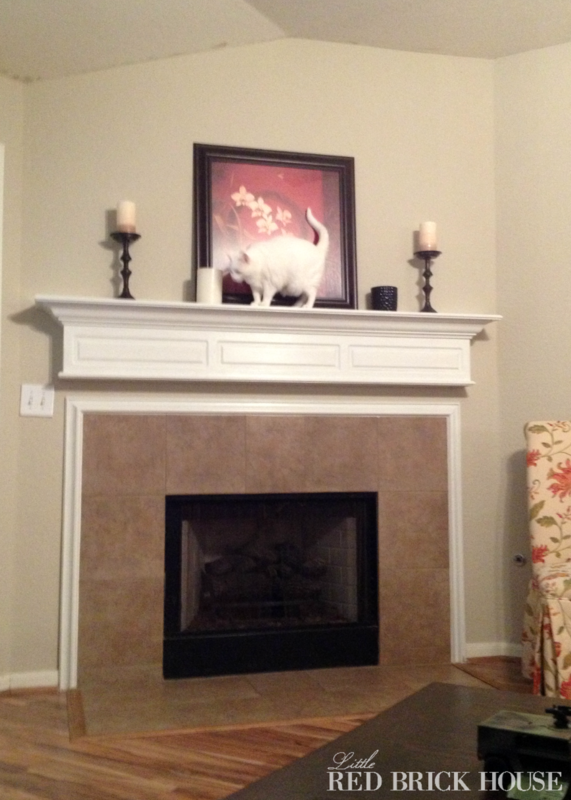 Your fireplace look amazing Sarah! I love all of the textures this room has. Found you through the Pinterest link up and pinned. Would love for you to come join in at The Makers link party on Tuesday mornings 8 eastern on my blog TinySidekick.com. Hope to see you there! Hi Corey! Thank you so much for your kind words! And thank you for pinning. I really do appreciate it. I will totally stop by your link party. Thanks, again! This is an amazing makeover! I love how you lightened and brightened it and just changed the whole look. It certainly has more presence now!! Hi Cindy! Thank you so much for your sweet comments! You did an amazing job – it looks fantastic, and it totally transformed the look of that space. Thanks for sharing. It’s absolutely perfect! I love all the texture with the stone and paneled wall! Love the fireplace and the new stone. I have been wanting to do the stone work so looking forward to seeing how you did it. Would you mind sharing the wall color you used? Hi Vicki! Thank you so much! I’ll have the stone work tutorial up soon. The wall color is Sherwin Williams Anew Gray in a flat finish. Absolutely beautiful! Great styling too. Thanks for linking up to On Display Thursday! Thank you so much for your kind words, Carmody! This is such an inspiration. My husband and I bought a house in October and hired a friend of his to do some work in the house. He has left the project leaving me with the tile removed and the stone (exact same as yours) just sitting in front of the fireplace. We have started to take the unfinished projects into our own hands and coming across this truly inspires me that we can do the fireplace ourselves! awsome job. What is the name of the stone snd Were did you get it? Thanks, Alan! The stone is the Desert Quartz Ledgestone from Lowe’s. You can read about how we installed it in this post. Thank you so much, Eileen! I truly appreciate you following along! We got really lucky and had extra laminate in the attic that the previous homeowners left. We just removed the tile, scraped up the mortar, laid down the thin layer of foam padding, and installed the laminate up to the fireplace. It’s a tongue and groove laminate so it was really easy to just pop those few boards into place. Great job… can you share your wall color ( not the ship lap) but the wall color here and in your entry? Thank you..
Hi, Sandi! Thank you so much! 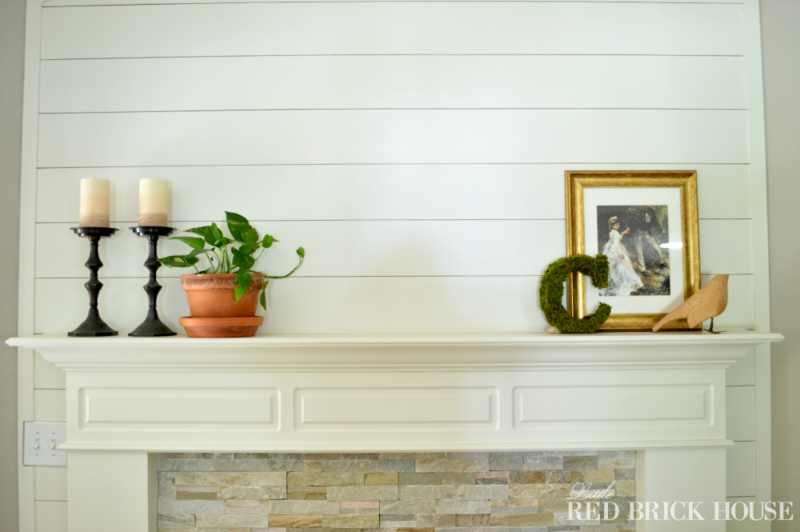 The wall color in the kitchen before we put in the shiplap is the same color that I have in the entryway. It’s called Oatbran from Valspar.